Pour milk and quinoa into a pot. Cook on high until it comes to a boil then turn down to simmer and cover for about ten minutes or until Quinoa is cooked. 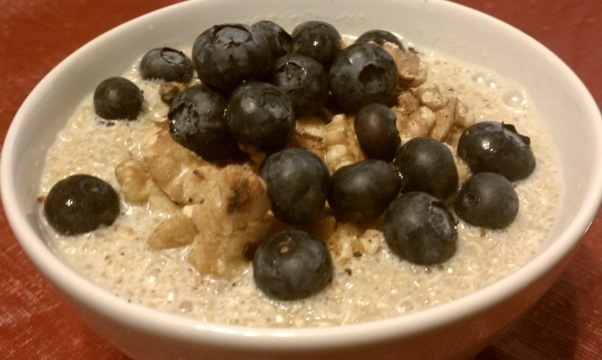 Spoon quinoa into bowls add toasted walnuts and blueberries and enjoy. If you wanted to sweeten it a little more you could add honey or maple syrup. Also if you like your porridge a little soupy you can add more milk or cream. This is so delicious and filling! I definitely have to try this one. It was so good I had more for dinner. You could use toasted pecans or almonds too if you wanted. I just used walnuts because that is what I had.